“Bel Canto: Contemporary Artists Explore Opera” examines the stories, traditions and themes of this most highly refined musical form, as well as the aesthetics, social influence and cultural impact of performance. The exhibition features the work of eight artists, and the large, multi-roomed space is draped in flowing curtains from the high ceilings, chandeliers guiding you from room to room. It’s an immersive experience of luxury and decadence. But as anyone familiar with opera will know, it is an art form that incorporates much more than sheer lavishness. Opera is about emotion, often incorporating themes of love, heartbreak, and betrayal. Bill Viola’s video “Becoming Light,” is inspired by the love story of the protagonists in Richard Wagner’s “Tristan and Isolde.” The short film is a rapturous underwater dance of two lovers entwined in an embrace that ultimately consumes them. It’s meditative and powerful tone conveys the emotional impact opera can have. 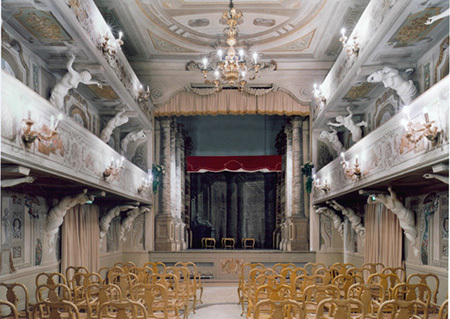 Matthias Shaller’s installation of 150 Italian opera houses from the 19th century, titled “Fratelli d’Italia” (or Brothers of Italy), is a stunning collection which highlights the influence of architecture on opera. Each photograph is the same size, and taken from the same vantage point, from the stage facing the balconies and elaborate ceilings. Aesthetically, the photographs create a cohesive portrait of an architectural style, while also enabling us to feel the sheer magnitude of space an operatic performer experiences on stage. One of the more engaging and immersive installations, Vasco Araújo’s “Diva, A Portrait,” transports us into the dressing room of an opera diva. The walls are painted a deep burgundy, with portraits of the performer hanging throughout. Gowns hang on a clothing rack in the corner, and on the vanity are bottles of nail polish and powder. What feels initially like an overtly feminine room contains typically male objects, including razors, aftershave, and men’s shoes. The installation explores the stereotypes of gender in performance, and alludes to the history of men performing in women’s roles. It continues to the next room with a video installation of the artist as diva, but with a female voiceover performing the operatic pieces. Guillermo Kuitca’s drawings and collages of abstracted theater and opera house floor plans are presented in bold, primary colors with explosive and gestural lines. His “Acoustic Mass IV (Covent Garden),” “Acoustic Mass III (Covent Garden)” and “Acoustic Mass I (Covent Garden)” capture the excitement and vibrancy live performance in stark contrast to the ethereal feel that most of the others artists here favor. Suzanne Bocanegra’s “Dialogue of the Carmelites” is based on Francis Poulenc’s opera of the same name, which recounts the true story execution of French nuns by anticlerical Revolutionaries during the French Revolution. Taking pages from the 1955 edition of the catalogue “A Guide to the Catholic Sisterhood in the United States,” Bocenegra deconstructs the book, highlighting the nuns on every page, and embellishing them with embroidery. The artist pays conceptual homage to the history of the Carmelites. The room is infused with music by composer David Lang, which lends the space a meditative, sacred feeling. The exhibition closes with a large-scale video installation by Yinka Shonibare CB, “Addio del Passato.” A re-imagining of Giuseppe Verdi’s “La Trviata,” it draws on the last scene of the opera in which the lead character, Lord Nelson’s wife, Fanny, sings of sadness and illness. Performed by black British lyric soprano Nadine Benjamin, Shonibare’s Fanny wears a Dutch wax printed fabric whose patterns are traditionally inspired by Indonesian Batiks, but which, through cultural misunderstanding, have come to represent African heritage. The scene places the operatic piece into new Art Historical and cultural context, while exploring postcolonial themes in a canonically Western performance work. “Bel Canto” demonstrates that opera is not a genre left in the archaic past. It is a vibrant and thriving form of performance, that can offer ample opportunity for fresh invention.